The Grand Canyon begins at Lees Ferry and deepens steadily as the Colorado River flows south, bisecting the sandy plains between the colorful opposing escarpments of Echo and Vermilion Cliffs. The gorge (known here as Marble Canyon) is always narrow, and due to the flatness of the land it is easily visible only around the US 89 road bridge - the last crossing of the river (southwards) until US 93 and the Hoover Dam, a 290 mile drive away. The Colorado can still be reached though, by hiking along one of the many side canyons of increasing length that cross the generally roadless land to the south; one of the northernmost is Jackass Creek, a rugged, rock-strewn gorge with many colorful sandstone strata, smooth water-carved channels, pools and narrow passages. Jackass Creek has two main forks that join 2/3 of the way between road and river, together with several more shallow tributaries, so a logical round trip is to descend one branch and return by the other. The directions below assume the hike begins down the north fork - this is easily located from the highway, and there is a parking area just beyond the bridge where US 89 crosses the canyon, which is on the east side of the Colorado between mileposts 532 and 533 (closer to 532). The creek itself flows only after rainfall; the streambed is dry for most of the year. 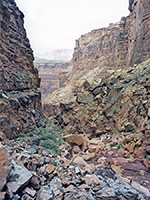 The creek crosses land of the Navajo Reservation and extends into the Grand Canyon National Park. A park fee is technically required, but there will be no-one to collect it; of more importance is the Navajo hiking permit, obtainable from the ranger station at Cameron or the tribal parks office at Leche-e-Rock (3 miles south of Page), although the likelihood of anyone checking is low. 12 views of Jackass Creek. TopoQuest topographic map of Jackass Creek. 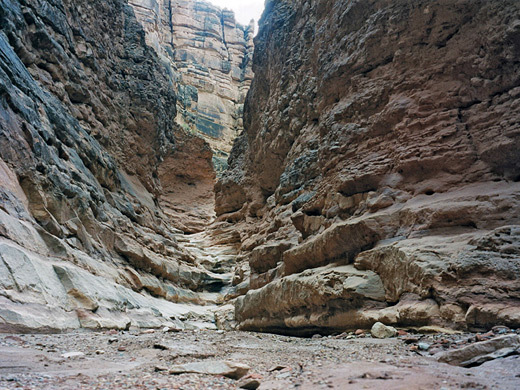 Near US 89, the canyon is V-shaped and shallow. Downstream, the land at either side soon rises, and the streamway deepens slowly but steadily. 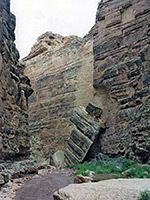 The cliffs are composed of many flat layers; variously white, brownish and stained black, with rocks that look especially old and weathered. Patches of mineralization run through the strata, with veins and nodules, and in places the rocks look more metamorphic than sedimentary. The streambed is covered in multi-colored pebbles - shades of purple, green, red and grey, with frequent larger boulders - all very interesting. 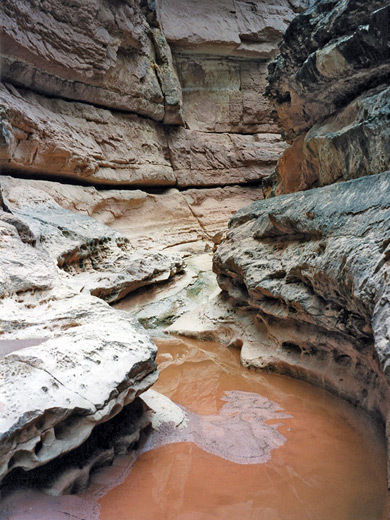 The canyon floor is usually quite flat, but with regular short vertical drops of a few feet as the creek flows over successively deeper rock layers. After 40 minutes walking, a small side canyon merges from one side and the main south fork joins from the other, as the gorge deepens more abruptly, containing larger fallen boulders that sometimes block the streamway. A short distance further is a short narrow section preceded by a 30 foot drop with a pool below. 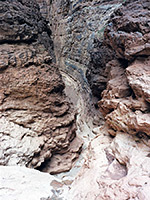 Climbing down unaided is just possible, but usually there will be several ropes, left by the Navajo who regularly travel this route to fish in the Colorado River. The canyon continues via a pretty section of smooth channels and shallow pools, enclosed by whitish multi-layered rocks. For the remainder of the way to the river, the canyon is filled with many fallen boulders and huge sandstone blocks of varying colors and forms - the Coconino sandstone walls above seem particularly unstable and crumbling. The creek deepens quickly, and much scrambling is necessary, over or under rocks and around the edge of muddy pools. Often possible routes have been marked with arrows by the Navajo as the best way ahead is not always obvious. After a total walk of 2.4 miles, the canyon opens out into a large sandy area with many cacti, shortly before the confluence with the Colorado, where a sign announces 'Welcome to the Grand Canyon National Park'. Another notice warns against approaching California condors, which fly here for water from their nesting grounds in the nearby Vermilion Cliffs. The river at this point flows over the Badger Creek rapids, one of the most extensive of such obstacles for rafters journeying south from Lees Ferry, and is quite impressive after recent rains when very fast-flowing, muddy water courses through the canyon - originating from the Paria River a few miles upstream. For about half a mile above the north fork junction, the south branch of Jackass Creek has a most beautiful and impressive series of circular pools, narrow channels, stepped and curved rocks, worn smooth by countless years of flood waters. 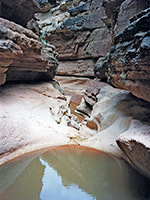 Following recent rainfall, some pools are several meters deep, although most can be avoided by walking along ledges above. There are several drops of 5-20 feet but only one significant obstacle - a deepish pool beneath a massive fallen rock, with a steep slope just beyond. This can be climbed, or alternatively bypassed using a rope that may be left nearby. The final stretch of the canyon opens out and branches several times when near to the main road. The starting point for the hike may be reached again after a half mile walk across the plateau above.